Discover how campers really felt this summer. 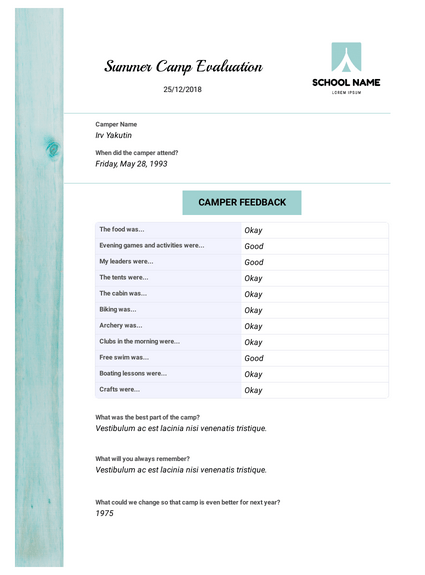 With JotForm’s Summer Camp Evaluation PDF Template, you can ask campers and their parents about their experience with everything from counselors to group activities to food to registration process. Each submitted response will automatically be saved as PDFs you can download, print, and share with your camp staff. Customize the template using JotForm’s drag-and-drop PDF Editor. Revise the provided text of the sample, write additional questions, or change the answer format from free response to a rating scale. With valuable feedback saved as PDFs, your staff can ensure everyone walks away a happy camper next summer. When did the camper attend? What was the best part of the camp? Vestibulum ac est lacinia nisi venenatis tristique. What could we change so that camp is even better for next year? Was this your camper's first time attending the camp? If yes, why did you choose the camp again?